Peter Ehrenkranz, senior program officer in HIV treatment, Gates Foundation. Peter Ehrenkranz's first brush with global health occurred after his junior year in college when he biked his way through Zimbabwe to learn about its hospital system. Ehrenkranz 02M/MPH was impressed by the ingenuity of health workers in Zimbabwe, including a doctor who discovered that a child's insulin could be kept cool by storing it in a clay pot buried in the ground. "Doctors in places like Zimbabwe have to think outside of the box," says Ehrenkranz. That premise has been the bedrock of his career, which has included seven years working in Liberia and Swaziland to reduce incidence of HIV and tuberculosis and strengthen health systems. 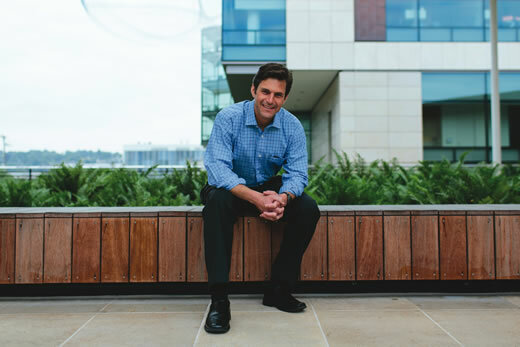 Last year, he moved with his family to Seattle to serve as senior program officer for HIV treatment with the Bill & Melinda Gates Foundation, the fifth-largest funder of HIV initiatives globally. "It's a great opportunity to take some of the lessons I learned in the field and apply them to a bigger policy sphere," says Ehrenkranz. "I'm trying to help move countries with high burdens of disease as well as funders who are even bigger than us—including the U.S. government—to be as innovative as possible. We're trying to use our funds to answer the questions that are going to be priorities three years from now. In a fast-moving field like HIV, we have to be agile." As an MD/MPH student at Emory, Ehrenkranz learned to strike a balance between caring for individual patients and improving health services delivery overall. After completing his medical training, he joined the Clinton Health Access Initiative as the senior technical adviser to the National AIDS and STI Control Program in Liberia. He saw patients once a week in clinic, where he helped identify the country's first cases of drug-resistant tuberculosis — which often affects HIV patients — and worked with the government to procure the recommended drugs for treatment. He also collaborated with program staff to write the nation's first HIV guidelines, train health workers, build a national public health reference laboratory, and create a sustainable drug supply chain. "In Liberia," he says, "we were drawing the dots, not connecting the dots." In Swaziland, where he served with the Centers for Disease Control and Prevention as the HIV care and treatment team lead and then country director, he partnered with the Ministry of Health to increase the proportion of people eligible for HIV treatment from 60 percent to more than 90 percent. After one year, more than 80 percent remained in treatment and had a suppressed viral load. "The viral load measures are equal to or better than those in the U.S. There was great leadership on their side," Ehrenkranz says. While there, he developed an interest in quality management and helped draft the quality and assurance guidelines adopted by the Ministry of Health to address HIV and TB prevalence rates — the highest in the world. He also supported the office in replicating a program from Liberia that brought county and central ministry health leaders together to present progress on key indicators, share ideas about what did and did not work, and increase accountability among all parties for delivering health care. In the Swaziland version, a sense of competition evolved among doctors at the biannual meetings where they received awards for successes, including most improved, best retention in care, and most innovative programs. "They still get together twice a year," Ehrenkranz says. At the Gates Foundation, he is expanding these peer networks to other countries to boost access to and quality of HIV prevention and treatment. Given that expected changes in World Health Organization guidelines will essentially declare that all people living with HIV are eligible to start treatment, the world soon will be asked to double the number of people receiving antiretroviral drugs with little change in the resources available to do so. The only way forward is to develop new models of service delivery that are less burdensome on health care systems and patients. That includes introducing new ways of testing and treating patients in clinics and hospitals and working with funders and agencies to provide patients with easier access to drugs.